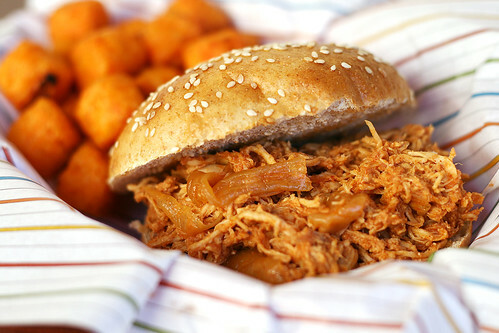 I’ve got a real thing for shredded or pulled BBQ sandwiches. Obviously using a fatty cut of pork is going to make for a moist flavor base for any BBQ sandwich. Sometimes, though, it’s nice to save a few a calories but that doesn’t necessarily mean you have sacrifice flavor (or have a dry sandwich). That’s where this recipe comes in. Using boneless skinless chicken breasts means saving quite a few calories. Using a slow cooker, big onion chunks, and flavorful base sauce means you still get the flavor. Now, this is going to sound really weird, but cutting the onion into big chunks and leaving them in there with the sauce and shredded chicken, was *almost* like some of the bits of fat you would come across in traditional pulled pork. I realize that sounds weird, but the onions soak up a lot of flavor from the sauce and they stay moist and a little chewy. So the burst of flavor and melt-in-your-mouth feel I got when I bit into them with the chicken just reminded me of, well, fat. But you know, without all of the guilt associated with eating a fatty piece of pulled pork. Call me crazy I guess. As for the sauce, it wasn’t exactly perfect when I first tasted it. It was missing some depth so I added 1/4 cup of brown sugar and slightly increased the tomato paste. I also upped the garlic because one clove seemed like way too little for my garlic loving self. That did the trick and really gave the sauce the flavor I was looking for. Below you’ll find the recipe exactly as I made it with all my final alterations. Finally, that beautiful sandwich bun? Yeah I made that myself. Wheat Brioche Sandwich Buns coming your way Friday! Add all of the sauce ingredients to the bowl of a crockpot and stir to combine. Add the chicken and onion and use a spoon to coat with sauce. Cook on low for 5 hours. Remove the chicken from sauce and shred*. While shredding the chicken, increase the crockpot heat to high and let cook for another 20 minutes, with the lid off, to thicken the sauce. Return the shredded chicken to the sauce and stir to evenly coat with sauce. *Have you seen the trick where you use a standing mixer to shred chicken? Genius and crazy easy all at the same time. Just put it in the bowl and use a paddle attachment and let your mixer do all the work. Alternatively, feel free to use 2 forks, 2 knives, or 2 caveman hands. Your call. >Haha! Yes, Jessy, they are tator tots! Actually they are one better than regular tots, because they are SWEET POTATO tots!! They are from Alexia foods and I was introduced to them at the Foodbuzz festival. Totally addicting! >This look sooo good! 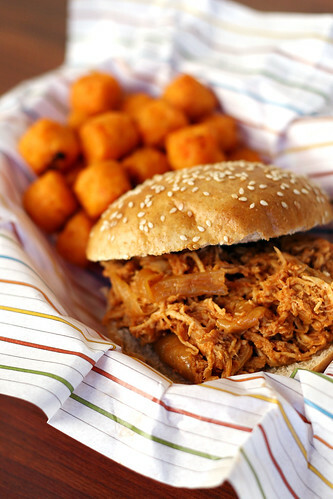 I usually make BBQ shredded chicken with bottle BBQ sauce so I'm definetly going to give this a try. >This looks so good. Going to give this a try! Thanks for sharing. >This looks delicious! I love that you used chicken to make it a bit healthier than BBQ pork. >Yummy! Love the onion idea. >Made this for dinner tonight and I can't stop nibbling at it! I got a little shred happy with my mixer though, oops. LOL Really good and I'll be keeping this recipe.